The Start-Up Series Fund is organised to invest over time in tranches in qualified finalists from a series of competitions which commenced in October 2016, the first investment being in April 2017. The competitions are conducted (in association with startups.co.uk) by Worth Capital who also provide commercial due diligence and post-investment support. The Fund invests in product and service businesses that are in attractive markets, have innovative products or services that can create new consumption behaviours, demonstrate the marketing and communication skills to build strong brands and have routes to an exit at a high multiple. The Fund invests in both Seed Enterprise Investment Scheme (SEIS) and Enterprise Investment Scheme (EIS) businesses. 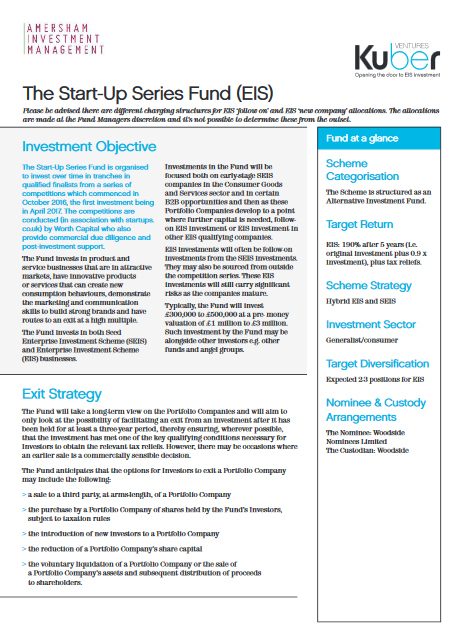 Investments in the Fund will be focused both on early-stage SEIS companies in the Consumer Goods and Services sector and in certain B2B opportunities and then as these Portfolio Companies develop to a point where further capital is needed, follow-on EIS investment or EIS investment in other EIS qualifying companies. 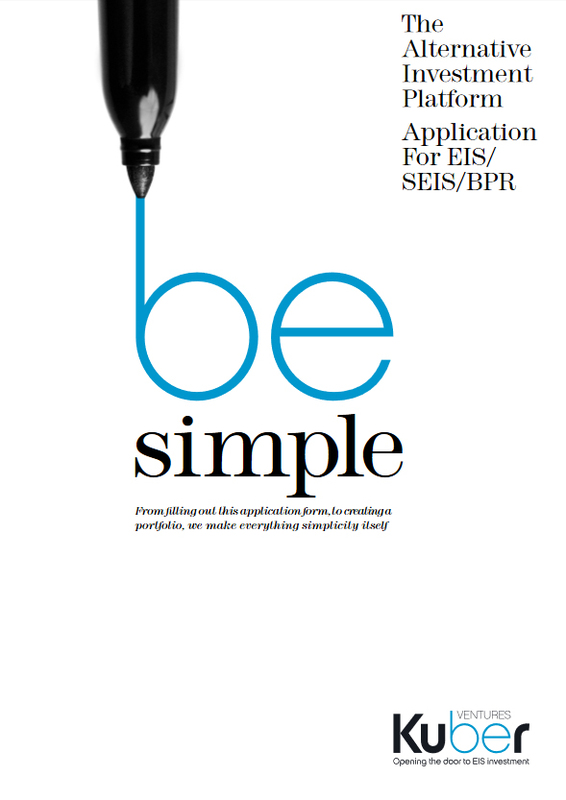 EIS investments will often be follow-on investments from the SEIS investments. They may also be sourced from outside the competition series. 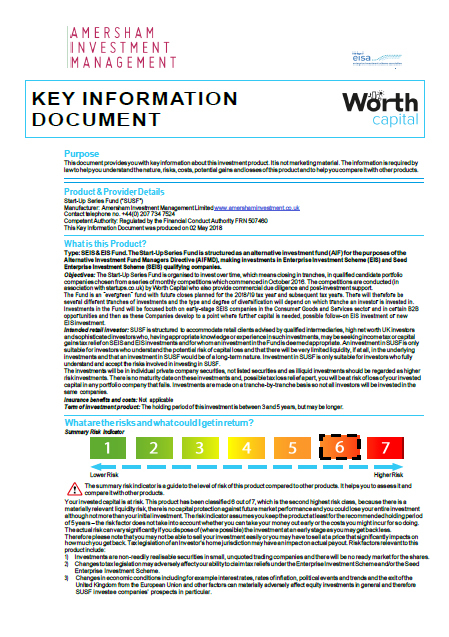 These EIS investments will still carry significant risks as the companies mature. Typically, the Fund will invest £300,000 to £500,000 at a pre- money valuation of £1 million to £3 million. Such investment by the Fund may be alongside other investors e.g. other funds and angel groups. 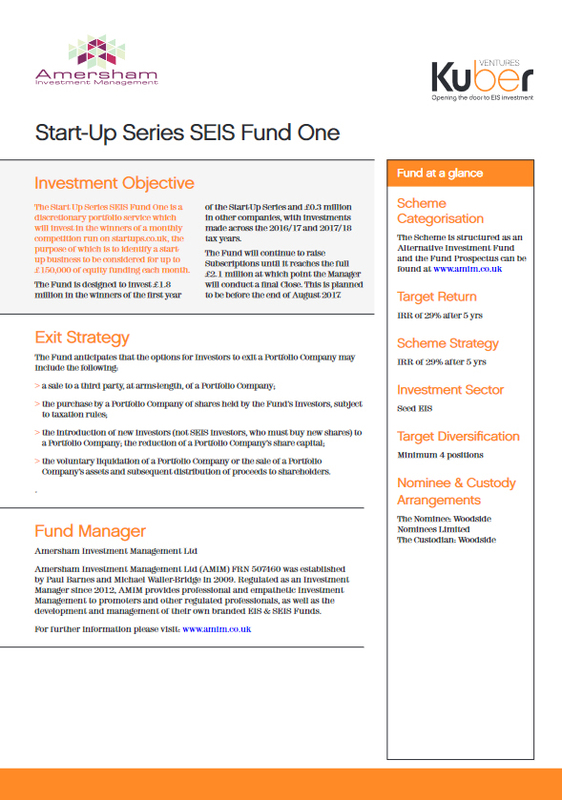 The Fund’s SEIS investments are sourced from the winners of the Start-Up Series – a monthly competition promoted by startups.co.uk. These SEIS investments are very young businesses and consequently carry high risk as well as potentially offering the prospect of high returns. Typically, the Fund invests £150,000 in each Portfolio Company at a pre- money valuation of £350,000 to £1.5 million. 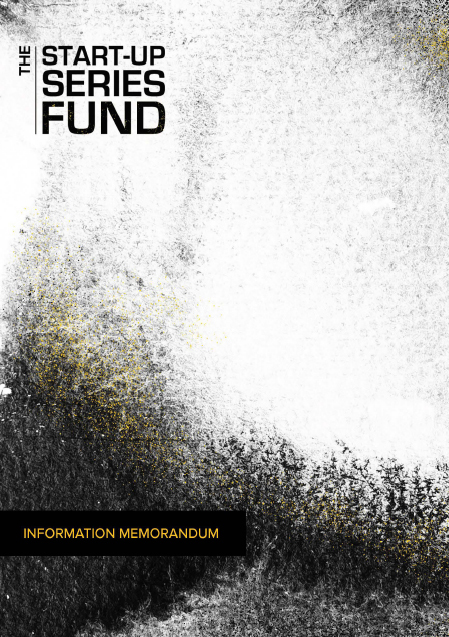 The Fund will take a long-term view on the Portfolio Companies and will aim to only look at the possibility of facilitating an exit from an investment after it has been held for at least a three-year period, thereby ensuring, wherever possible, that the investment has met one of the key qualifying conditions necessary for Investors to obtain the relevant tax reliefs. However, there may be occasions where an earlier sale is a commercially sensible decision. the voluntary liquidation of a Portfolio Company or the sale of a Portfolio Company’s assets and subsequent distribution of proceeds to shareholders. A UK investment firm focused on the provision and management of funds for both early and growth stage company investments using SEIS and EIS, Amersham is a leading specialist investment firm for start-up funding and junior venture capital, having invested over £6M in more than 40 SEIS qualifying companies, alongside over £23m in EIS qualifying companies and over £2m in BPR/IHT assets (August 2017). Amersham Investment Management Ltd (“AMIM”) was founded in 2009 by Paul Barnes and Michael Waller-Bridge for the purpose of developing specialised investment management services. Themselves entrepreneurs of record, Amersham’s directors have a keen understanding from first-hand experience of the requirements and challenges that face early-stage and growth stage businesses. Worth Capital have designed an innovative approach to seed equity funding by running competitions to unearth smart entrepreneurs with bright ideas. They provide investors with the opportunity to invest in ambitious start-ups from their beginning. They work with brands and media partners to gain cut-through in a frenzied entrepreneurial space. Thousands of UK start-ups engage with Worth Capital’s competitions every year and a select few are chosen for life changing investment. They receive the kudos of winning a huge competition, publicity and support to accelerate and grow their business. Investors can participate in a highly tax efficient Fund and access a ‘mini-portfolio’ of expertly chosen early stage business each with an innovative service or product. The model is designed to ‘stack the odds’ of seed investing. 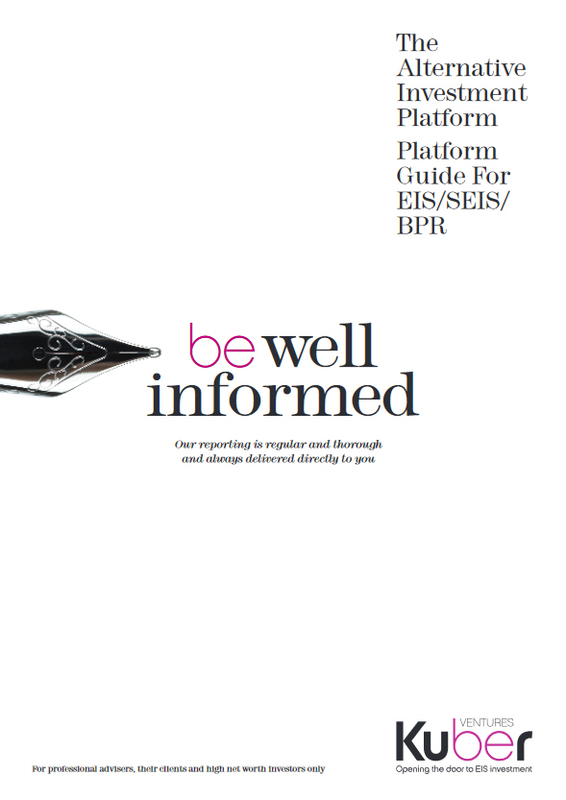 Please be advised there are different charging structures for EIS ‘follow on’ and EIS ‘new company’ allocations. The allocations are made at the Fund Managers discretion and it’s not possible to determine the risk profile relating to these from the outset. EIS: 190% after 5 years (i.e. original investment plus 0.9 x investment), plus tax reliefs. SEIS: 240% after 5 years (i.e. original investment plus 1.4 x investment), plus tax reliefs.